Combine chicken, celery, lemon juice, onion, and salt. Chill for several hours or over night. Right before serving, add mayonnaise, grapes, oranges, and toasted almonds. 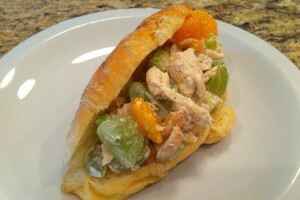 I typically serve this AMAZING chicken salad with mini-croissants. SO GOOD! Great meal for a warm summer day! This entry was posted in Recipe and tagged Recipe by KHill. Bookmark the permalink. This looks so yummy. I am going to have to give it a try next time I’ve got a hankerin’ for chicken salad. I love your idea of cooking the chicken in the crock pot.